For a few recent appearances of hers, Rekha did what she does best… Silk saris with a side of ott-ness. Like what you see? its her uniform by now.. but only shes best in it.. extravagant sarees, with complete jewels gajra, and elegance. still not loud as it could end up being. Love her style completely, has always OTT yet traditional. 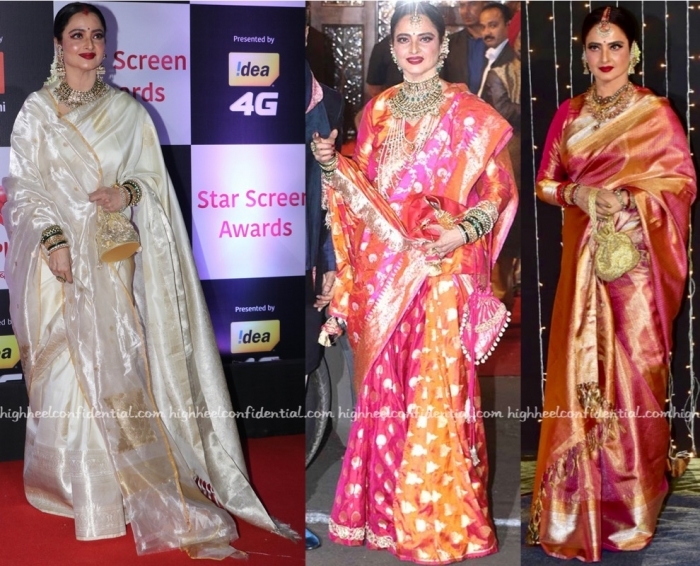 She reminds me of the stylish generation of my mother who believed in dark maroon lipstick and kathan sarees in gorgeous traditional drape in weddings, Rekha remains the pied piper of that era. 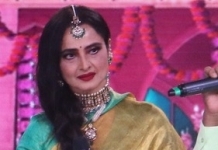 But recent time Rekha still being the epitome of beauty and style for the entire sub-continent, seems to be engaged in pushing it to a pantomime level. It is a common traits currently in bollywood ladies party dressing, wearing all at once. I really wish to whisper to this magnificently stylish lady — no need to improve perfection. My god goodness gracious what the actual @#$% is this! I get that this is her brand but she should tone it down a bit, it hurts my eyes to look at these garish outfits and that makeup, and that red lipstick and that horrendous jewelry she wore to the AMBANI event! Hey Bhagwan. At this point Rekhaji looks like a wedding store mannequin. What on earth is that on her face in the white saree? Did she just coat herself with some kind of illuminator product? The white sari is a beauty. Rekha is completely OTT but thats her trademark and no one can do it like her. White saree is so beautiful but ruined by that dupatta on right shoulder and heavy jewelry. If Rekhaji had worn simple jewelry (like Karishma in white saree at Ambani’s) and soft makeup, this look would have been million bucks. I love the saree at Priyanka’s reception but again ruined by teeka, humongous earrings and full blouse. How beautiful this could have been with minimal accessories. I am so done with the ott bling of looking like a Christmas tree that stole the whole stores deco. It’s very Great expectations’ Ms Havisham and someone needs to call it out that this is not looking nice. I feel the artificial adulation on the ott bling that madam Re owns is just making the point worse at every sighting when she could do so much better. She should change it up. It’s always the same. At least the woman buys her own saris being a celeb. She is not some walking talking freeloader. Props to her, just for that. She can shine like a 1000 diamonds, I don’t care. 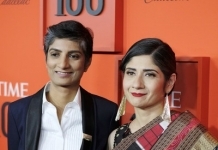 Wears her own saris and wears her own jewelry. Doesn’t look out for designer freebies unlike others. And has an individual style, though OTT. And wears handloom, her heritage. Didn’t become a wannabe despite moving to Hindi industry. She needs simplicity but I don’t think she will do it. 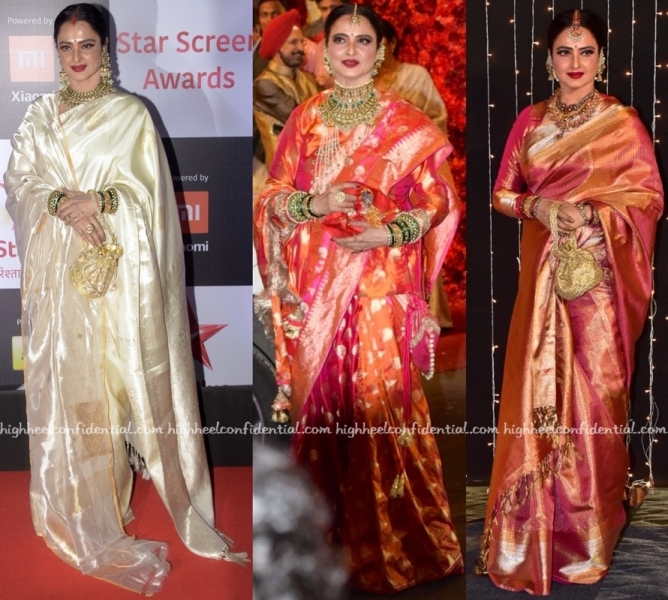 I am not a fan of Ms Rekha but after looking at her sightings all these years, I observed that she repeats her saris and jewelry many times. Not like only twice, but many times. Check out her name in google images, you can see it. And also her jewelry is very old type like she bought it when she was working as an actress. It looks oxidized and worn out after using for all these years. Just an observation. No. I’m so done. She needs to stop. Yes no one does it like her but no one needs to at every event. She turns up the exact same OTT way doesn’t matter what the event in question is. I LOVE HER SAREES but she rarely lets the beauty of them shine through, she’s so bedazzled out and caked up all the time. It’s so garish. Gd lord….what does she do to get such flawless skin? What?! I had once commented here that Rekha looks like a caricature of herself, since, I found Rekha improving a wee bit. In one post, her gold saree had some purple, and here she looks really nice. I detest her potli purses but her sarees and typical get up looks cool, she looks great if she doesn’t just stick to gold and do Bappi Lahiri.